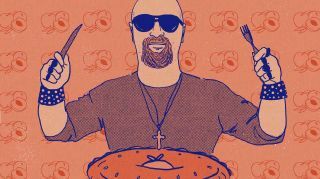 Featuring 30 individually illustrated recipes with pun-tastic names like Tofu Fighters, Captain Beeftart, Dim Sum 41 and Bachman Turnip Overdrive, the book is aimed squarely at the rock fan with time in the kitchen and room in the belly. The book also features an ‘Equipment Matrix’, which allows cooks to match recipes with the tools at their disposal, a section on dietary information for vegans and the gluten-intolerant, and a Spotify Playlist that allows every hard-rockin’ chef to enjoy some suitable sounds while they conjure up steaming plates of Metallikatsu Curry or delicious slices of Slayer Cake. We decided to test the book, and picked three recipes to attempt in the Classic Rock kitchen: A starter of Fleetwood Mac & Cheese, a main course of Limp Brisket, and an ambitious stab at Whitesnaked Alaska for dessert. First up, Fleetwood Mac & Cheese, subtitled, ‘You Can Cook Your Own Way’. And, to be perfectly frank, we kinda wish we had. It’s a perfectly serviceable recipe, but the results are a little bland. We’d recommend adding a touch of curry powder to lift the cauliflower (as suggested by the great American chef Thomas Keller in his excellent Ad Hoc At Home collection). We’d also recommend introducing a dash of Lea & Perrins Worcestershire Sauce to the cheese sauce to add a little more piquancy to the overall dish. Next up? Limp Brisket. We deviated from the recipe by knocking up some proper beef stock in the pressure cooker (the book actually calls for supermarket stock pots), but the brilliance of many a brisket is in the rub, and the fajita seasoning used here is a surefire winner. With chilli powder, paprika, salt, sugar, onion powder, garlic powder, cayenne pepper and cumin all fighting each other for spicy prominence (we also added some Old Bay seasoning, because we add it to everything), it provides an enticingly tangy coating for meat so tender it falls apart if you prod it. Unctuous, as they say. Tip: As we didn’t eat all the Limp Brisket in one sitting, we were able to use the leftovers to spice up the leftover Mac & Cheese, reheating the latter with a delicious meat topper. Mmmm-mmmm. And for dessert? A take on the classic Baked Alaska, the Whitesnaked Alaska (tenuously subtitled, ‘Here I Go Meringue On My Own’). After preparing some homemade vanilla ice cream, a syrup sponge cake and the meringue (meringue zealots will be delighted to learn that the Italian method is used rather the French), we managed to combine it all into something that kinda sorta looked like it was meant to look, then blasted the fucker with our blowtorch. The result? Divine, with the light, syrupy sponge providing a bed that allowed the meringue-encrusted ice cream to truly shine. Overall, Dark Side Of The Spoon: The Rock Cookbook is a book aimed more at the rock fan than the serious cook. They’re all familiar recipes, and the real attraction lies in the delicious puns and often-brilliant illustrations as much as with the dishes they accompany. As such, it might just be the perfect Christmas gift for the culinarily curious rock fan in your life. Dark Side Of The Spoon is available now from Amazon, or from the Dark Side Of The Spoon website.